GLAMOUR & PEARLS: My perfume collection / favorite scents / fragrance reviews! My perfume collection / favorite scents / fragrance reviews! 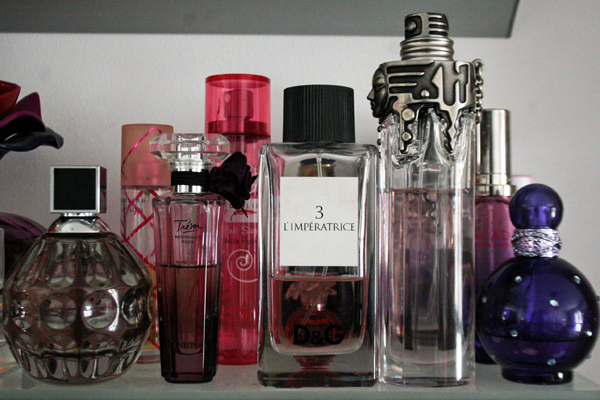 What would a personal fashion & beauty blog be without a perfume post?! I'm absolutely addicted to perfume. I love it so much that it doesn't matter where I am, I always find myself sprinkling my favorite scents all over me. I could never leave the house without it, and I think no woman should exit without using any either! 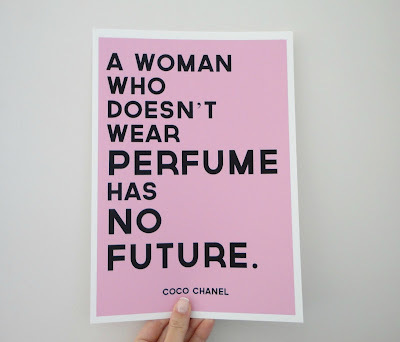 Coco Chanel once famously said "A woman who doesn't wear perfume has no future." I have to agree! It's just a vital part of a womans everyday routine. I get tons of questions and compliments about what kind of perfume I'm always wearing, which is always a different one actually, depending on my mood. If I'm feeling playful or really happy and full of joy, I'll wear something more fun and fruity. If I'm in more serious kind of mood, I'll choose a much stronger scent. I think it's definitely fun mixing up your perfumes everyday! I can just never get enough of the lovely scents, and I wish I could just sprinkle all of them on myself! Haha! It's no secret that I love perfume and everyone I know is aware of that, that's why for birthdays or Christmas time, someone always gets me perfume! It makes me happy because its not a useless present that you use in a short while, they last ages, and as I said previously, they are a vital essential to a woman's everyday needs! Anyway, I wanted show you guys which ones were my absolutely favorites, and as you can see I have taken a picture of my little perfume area too, so you can visualize it as well! I also decided to write a rewiew on each of the frangrances I owned, I figured it could be a help to anyone who is looking for a new perfume or just wants to try something different out. To me, this scent is the epitome of womanity, just like the name of the perfume. It makes a statement when you wear it, its both fruity, sweet and savory at the same time, its hard to explain what it smells like exactly, but to me its the perfect unique mix of those 3 accords. It is described as fruity Mara des Bois strawberry, sweet white fig, and last but not least savory caviar. Yes, caviar! Which I think makes it smell so unique. It definitely can't be compared to any other perfume in my opinion. I am on my 3rd 100ml bottle now, and there is no question that it will always be my favorite. I always always get asked what I'm wearing when this is on me, I just love it! I am a big lover of Viktor & Rolf's Flowerbomb perfume, but unfortunately it's very hard to get ahold of it here where I live. When I was based in Australia, it was one of my favorite everyday scents, but its just too much hassle trying to find a store that sells it here, because its just practically impossible! It makes me really sad, but the fact that Jimmy Choo's new perfume is basically a dupe for it makes it all better! I've wanted this perfume for a while now, and I was lucky enough to receive it for Christmas this year. It is the ultimate glamorous perfume for me! If perfume could have attitude, this would be it! I would say the scent is rather fruity with a deep woody base. I love super sweet smells and this is kind of like caramel toffee to me, it's very fresh & vibrant at the same time, I would just describe it as: the utlimate Confidence. I squealed with joy when I first noticed D&G's brand new perfumes at stores, and I immediately had to try all of them out! What caught my eye the most though, was number 3. I would describe this as a very fruity, watery, fresh scent! It reminds me of watermelon and kiwi sorbet, and what's to love about this even more if that it doesn't smell synthetic. 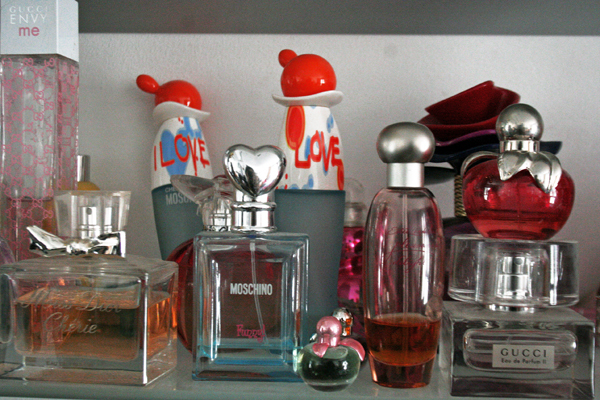 Some perfumes just smell like... too much, to fake. This smells expensive! And to top it all off, it is unisex also, which weirds me out a bit since it's so sweet, I just don't know if I can imagine a guy wearing this. Anyway, it still tops my top 5 perfumes that's for sure! I received this perfume from my boyfriend for my birthday, and I have to say, I'm addicted to it! As you may have realized already, I just love violently fruity, sweet scents, and this is definitely it! To me, it smells like a mix between raspberries and blueberries, with a touch of vanilla, pink pepper & musk. The heart of it is actually floral - jasmine & peony, which I don't notice that much, maybe because I'm just too disctracted by the fruityness. Anyway, if you like berries and sweet fruity scents with a touch of vanilla & a floral base, then you'll love absolutely this! Ok, I have to admit that I'm not a big fan of celebrity scents, but my best friend had Fantasy, which is the original scent Britney released. After she purchased it, she made me smell it and to my surprise, it was great! I decided to try Midnight Fantasy as well, and I definitely fell in love with this more than Fantasy, the pink bottle version, which is kind of like a mix of red lychee, exotic kiwi, and chocolatey cupcakes with creamy musk base. Sounds good doesn't it? But to me, the purple bottled yummyness is much more charming! It smells like a mixture of black cherry, strawberry, plum, with a vanilla musk. Like some kind of delicious candy! Some would describe this perfume as too sugary & cheap smelling, very syrupy, but I just love it! It's like a fruit cocktail, you just want to eat/drink it! I promise there will be some more florally scents as well, but for now I have to introduce to you another very fruity berry-like perfume, Escada's Moon Sparkle! I would say this perfume is very similar to Lancome's Tresór Midnight Rose and Britney's Midnight Fantasy, maybe because of the berry scent it has. It's much softer and not so artificial as Britney's perfumes though, but still there are people that don't really take Escada perfumes seriously, some would say they smell too cheap and trashy, but I just love all of them! I want to eat all of them, the fruity goodness is just too good! One sniff of this purple bottled scent and you'll feel like you're on vacation on a tropical island! To me it smells like black currant, delicious apples and strawberries, but mainly the black currant, that's what I notice first. It is definitely different to other Escada perfumes, as the citrusy note isn't as prominent. This was a present from one of my friends, and if it wasn't for them, I'm not too sure whether I would have bought this myself. I am absolutely in love with this and cannot compare it with any other perfume I've smelt before, and it's not the typical smell that I love, but it's very unique and hard to describe what it reminds me of, its kind of minty to me, if that makes sense, not extra sweet like most of my other perfumes, althought it is described as a mix of black currant, mandarin, bitter orange, violet and black berry. I think the first thing I notice is the citrusy smell, and then it fades into the violet and blackberry notes. It's very clean and delicate at the same time. It's very lovely in my opinion, and if I run out of it, I am definitely repurchasing! When I think of Estee Lauder, her older and more classic fragnances immediately come to mind, although this new scent which was released in 2007 is surprisingly different from what we're used to. It's smells like rich caramel, strawberry icecream, marshmallows, pomegranate, and sugared rose petals. It is more delicate, sophisticated and powdery than all the other sweet perfumes I have, and that's why this is one of my favorite as well! I love wearing this! This perfume is just too cute! I fell in love with the bottle first, and after smelling it, I just fell even more in love with it! It is fruity and sweet, but it's more citrusy at first, like lemon candy, with calabrian lemon and caipirinha lime, and then it settles into a sweet vanilla infused caramel-style toffee apple, just like the bottle! It reminds me of fairy floss & candy shops, it's a truly lovely fragnance, one of my favorites as well! I also have Love by Nina, the green apple, Le Paradis de Nina, the soft pink apple, and Nina L'elixir in a small bottle version, which came in a set, and I have to say I love those also! Love by Nina is sweet and girly, and delicate, its very fresh and light and smells like grannysmith apples, almond, frangpipani and cherry blossoms! Le Paradis De Nina is also a very girly scent, but its very light and almost fluffy, if we can say that. Instead of a heavy syrup, this fragrance is like a thin layer of icing sugar on a vanilla cupcake. The conclusion of it all is, that Nina Ricci can do no wrong in my opinion! 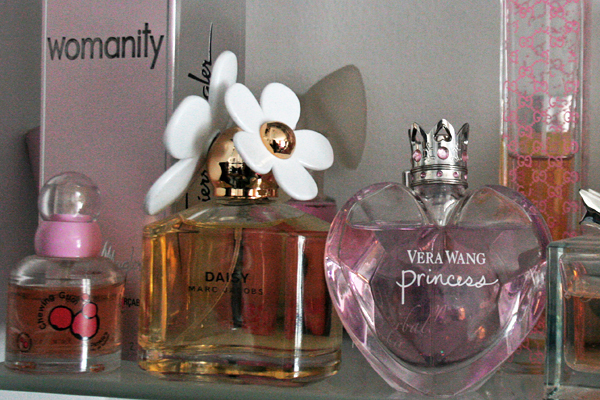 All her perfumes are fun, sweet and girly! I love them! The perfect summer scent: Moschino - Funny! I'm so happy my mom got me this perfume, it's my absolute favorite summer fragrance! It's a really fresh citrussy scent, mainly fruity bitter orange with a hint of pepper, and a clean musky base, peonies & green tea. It smells sooo good, especially on a hot summer day. One spritz of this and I instantly feel so much fresher & more alive! It's a really fun & vivacious scent, I'm in love with it. When I think of perfume, Chanel immediately comes to mind. No. 5 was the first ever perfume produced by Chanel, and it has been a number 1 seller ever since, for decades! As a fun fact, Marilyn Monroe allegadly wore it too, she once said in an interview! It was said to be one of her favorite scents. My mom uses No. 5, and a lot of other Chanel goodies, it's the only scents she uses, and I have to say I also really love the No. 5, it is such a classic timeless fragrance. You can immediately tell someone is wearing this, it's just so genuine and one of a kind. I feel like Chanel Chance is more my style though, it's a big younger than No. 5, and I love using this when I want to be a bit more elegant or when I have to go to an event. It reminds me of my mom in all ways, and I have to say the lasting power for Chanel fragrances is insane! One spray on your coat or scarf or any piece of clothing, and it'll be there forever! The smell to me is a bit peppery and spicy, with traces of soft floral notes. It is very oriental with hints of patchouli. What I've noticed is that men always seem to compliment when I wear this. I think the main reason is because it's a very powerful, elegant & sophisticated feminine scent that men also love on women. The ones I mentioned above are my absolute favorites, which means I would and I am indeed going to repurchase all of them once I run out! Now, there are some other scents I also have, I wouldn't buy them again, but I will write a review on them too. This is probably my least favorite of the sweet, fruity perfumes I have, maybe because it's a much deeper and stronger scent, it's very rich, but then again, what do we expect from Cartier? It smells very intense, like juicy red cherries and subtle vanilla. Kind of like chomping into a big toffee apple or eating glazed cherries, but its just still too rich & deep for me. Not too bad, I just prefer the other ones over this though! I can't really decide if I love this or hate this. When I was younger, I definitely adored this perfume, but nowadays I just don't really think too much of it. This fragrance is described as a very feminine scent, florally with some sweet caramel popcorn & some fruity notes, but this just doesn't do it for me. I don't smell any of that. What I notice first is the woodyness and floral notes. I would say it's a very light, almost transparent floral scent, that is more lady like than girly. Overall it's a good perfume, I just wish I could smell the sweet side of it more. I have a love/hate relationship with this perfume also, like the Miss Dior Cherié. It's not the typical perfume I would expect from Gucci. It's crisp, clean and fresh, to me it smells like shampoo or some kind of hair product. To be honest, I just really dislike the floral notes. It's a mix of tangy pineapple, which you can definitely smell at first, mango, pomegrenate, pink pepper and peonies, while the drydown is supported by a powdery rose note. It's good, but I wouldn't call it my favorite. I prefer my other perfumes to this! I asked for this for my birthday last year, because of all the hype it got when it first came out, but I just really dislike this perfume now. I have used it maybe twice, or three times the most. It's just so unflattering in my opinion. Ok, and I admit, I fell in love with the beautiful big flower bottle, it's so amazing, I had to have it, and based on everyone's feedback I thought the perfume will be just as amazing as well. Shame the smell is just terrible though. I really can't say anything good about this fragrance, I really dislike everything about it. It's so strong and intense, I cannot really make out what it smells like. It is described as pink peppercorn, pear and ruby red grapefruit, which I can definitely smell, and I just really dislike grapefruit, so I guess that explains why I'm not too keen on this product. The base notes are creamy musk, vanilla & tonka beans, which I can definitely smell too, I just don't think it's a good mix. It's more like a great big mess to me. Sorry, MJ! Like all Marc Jacobs fragrances, the bottle design of this is just so pretty! But sadly, that's about it for me. This perfume to me, smells like bath soap. It's too grassy & florally, way too light & clean for my liking. It is described as having strawberry, violet leaf and ruby red grapefruit as the top notes, gardenia, which I can totally smell, violet petals and jasmine as the middle notes, and finally musk, white woods and vanilla as the base. Overall, this has to be my most disliked scent of all the ones I own. The bottle of this perfume is the prettiest thing I've ever seen! Just like the name says, it is fit for every girl who has ever dreamed of being a Princess! Unfortunately, it stops right there for me. I first saw this fragrance on board a flight me and my mom were on, we immediately fell in love with it, and without smelling it, my mom decided to buy it. Worst decision ever made! I've used this product ONCE, and never again. It's just terrible to me, even worse than Marc Jacobs Daisy. All I smell is freshly cut grass & too many flowers, it makes me cringe. I'm sorry to everyone who owns this and happens to love it, I don't mean to offend anyone, but this has got to be the worst scent I've ever tried. I knew I should have gotten Princess, the purple version, instead of this flower bomb. 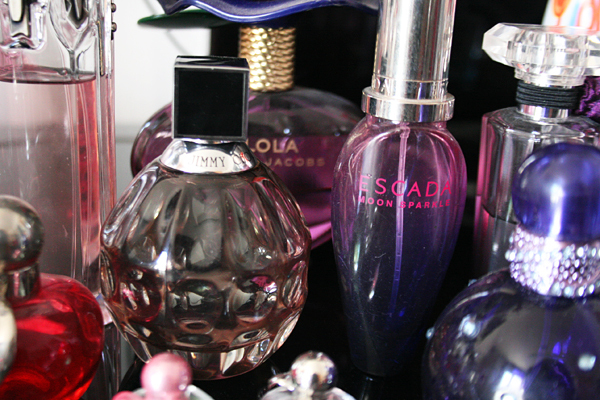 I think I mentioned all the perfumes that I currently own above and which you can see on the pictures as well! I have tried several other ones in the past, like J'Adore Dior, Versace Bright Crystal, Estee Lauder Beyond Paradise, Dior Addict 2, Dior Star, Dior Forever & Ever, lots of Chanels, No. 5, Mademoiselle, Coco Noir, several Escada scents, and God knows how many more! I'm too obsessed, like I said! Haha! I hope this post was a help to anyone who wants to try out something new & is looking for a review or just a quick opinion. Of course, you'll have to smell the perfume on yourself, its the most important step when purchasing a new fragrance, because honestly, it smells different on everyone. 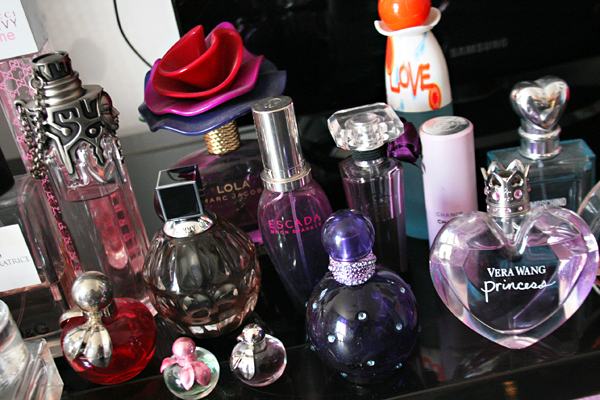 If any of you own any of these perfumes, leave a comment & let me know which one your favorite is! 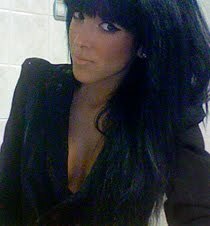 Or maybe suggest me one that you think I'd like?! :O I'm open for suggestions! Their rarity, the thrill of finding it and appreciation through time can give the collector a sense of satisfaction. Natural Rawhide Bone Pressed For Pet Parents, Our Rawhides Are A Great Way To Offer A Safe And Healthy Outlet For Your Dogs' Natural Chewing Instinct --And That Can Come In Especially Handy With New Puppies Prone To Chew Everything In Sight.